Danielle George looks at the light bulb to show how to hack, adapt and transform technologies found in the home to have fun and make a difference to the world. 30/12/2014: Danielle George looks at how to hack, adapt and transform using a phone’s technology. 31/12/2014: Danielle George attempts to use simple motors to construct the greatest robot orchestra. Over the Christmas holidays, I’ve been thinking about getting outside in the fresh air. However, I’m not normally in the habit of doing something without a good reason to do it. So I had to come up with a reason for going outside. With Guernsey being surrounded by the sea I figured I’d head out to the beaches and see what I could find in the way of sea glass. I’m not really an artistic person, so I’m unlikely to use it myself. I’ll probably donate it to people that come along to Make Space once it’s set up. If you want to get your hands on it, sign up to the newsletter. I would love for an artist to be able to make something beautiful from these items which someone else considered to be junk. I’ve been reading the (audio) book The Maker Movement Manifesto by Mark Hatch. This book is pretty much a blueprint for workshop that we’re in the process of setting up in Guernsey. Many of the case studies are taken from Techshop, a chain of maker workshops across the USA, of which he is CEO. Throughout the book he makes reference to Autodesk software, which is used for designing products to be machined on CNC and laser cutter machines, etc. My experience of Autodesk is of AutoCAD and, at £1500, isn’t really designed for the hobbyist maker. However, what I was reading indicated that Autodesk may have a range of software aimed at makers. That’s exactly what I found in the 123D apps. This is a really great way to get started with Arduino, without having to spend a penny on buying one for yourself. Rest assured, once Make Space is up and running, we’ll have Arduinos available for playing and prototyping. So get a head start with testing out your ideas in 123D Circuits now! Ever played Mario on Play-Doh or Piano on Bananas? Alligator clip the Internet to Your World. 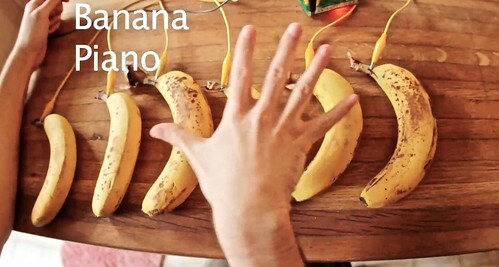 ➜ Hack a Banana, Make a Keyboard!